, an excellent miniature painter, was born at Tubingen, in the duchy of Wirtemberg, in 1735, and came to England in 1749, with his father, who was portrait-painter to the duke of Wirtemberg, a painter, says Edwards, of small subjects, but of no great talent. 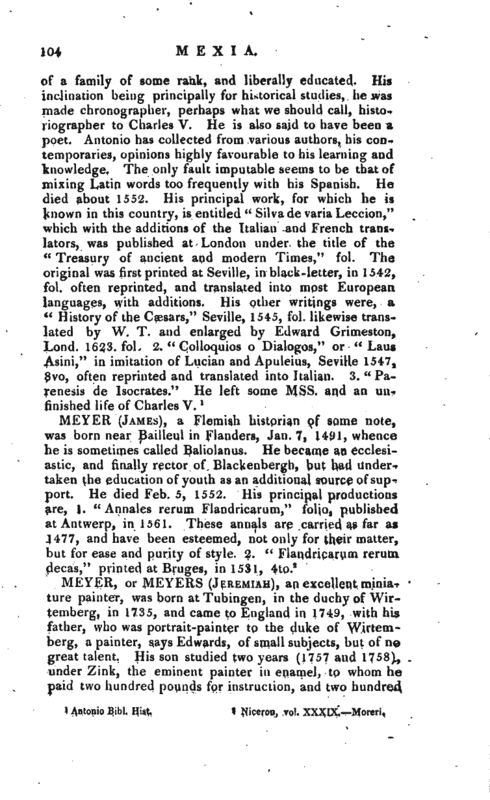 His son studied two years (1757 and 1758), under Zink, the eminent painter in enamel, to whom he paid two hundred pounds for instruction, and two hundred | pounds more for materials of his art; but Meyer soon surpassed his master, in the elegance and gusto of his portraits, a superiority which he acquired by his attention to the works of sir Joshua Reynolds, who, as well as himself, was at that time rising to fame. 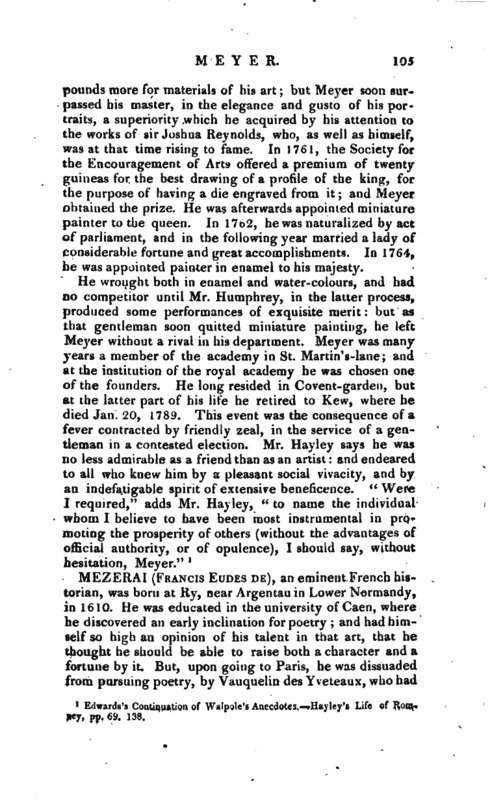 In 1761, the Society for the Encouragement of Arts offered a premium of twenty guineas for the best drawing of a profile of the king, for the purpose of having a die engraved from it; and Meyer obtained the prize. He was afterwards appointed miniature painter to the queen. In 1762, he was naturalized by act of parliament, and in the following year married a lady of considerable fortune and great accomplishments. In 1764, he was appointed painter in enamel to his majesty. 1 Edwards’s Continuation of Walpole’s Anecdotes. Hayley’s Life of Romney, pp. 69. 138.